This is the last in a series of three posts on the different types of super powers we all have. What is the best funeral you have ever been to? Crazy question huh? I thought about this question a few weeks ago while listening to a sermon by our Missions Pastor, Omar Garcia (gobeyondblog.com). Unfortunately I have been to a decent amount of funerals and military memorial services. Although each of these services involve mourning, there are some that are profoundly celebratory. What makes these services different than the others? It’s the legacy left behind. Birth of a Legacy: During a long nighttime stakeout in the spring of 1980, U.S. Customs Agent Tommy Austin tells Arizona Department of Public Safety Officer Ron Cox his problem. His wife’s friend has a small son named Chris who is probably going to die of leukemia. The seven-year-old boy dreams of becoming a police officer. Running into bureaucratic hesitation at Customs, Austin asks Cox if maybe DPS can do something. Together they enlist the help of others who hear about Chris’ story. They arrange for Chris to spend a day as an honorary DPS Officer. He rides on a police motor cycle and patrol car and even flies in a DPS helicopter. Four days later, the young boy passes away. As Cox and Austin leave the hospital that sad day, they discuss in awe how so many people stepped up to grant this young boy his final wish. They wonder if they could do the same for other kids with terminal illnesses. 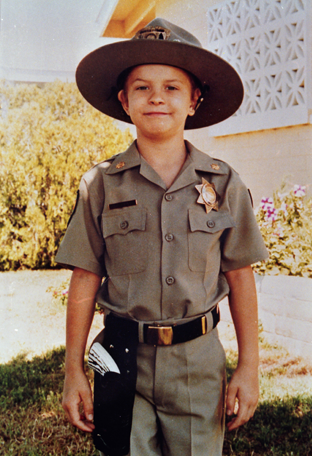 From their desire to serve others the Make-A-Wish Foundation was born. Today this foundation grants a wish to a sick child every 38 minutes. For these men, their legacy of service will inspire others for generations. For better or for worse, we will all leave a legacy. This legacy will be much more than the words in our obituary. It will be defined by the impact we have on the lives of others. Our Creator has handed us a portfolio of valuable gifts. Do we use them for self-fulfillment or self-sacrifice? In the Sermon on the Mount, Jesus encourages us to seek first His kingdom. What do you seek first? The answer to this question will determine your legacy. This entry was posted in Family, Leadership, Sacrifice and tagged leadership, Legacy, Power. Good word, Brad. Ocean rower Roz Savage’s life changed after she took the time to write two obituaries — the one she had and the one she wanted. We would be wise to do the same. Doing so might make all the difference in the kind of legacy we will leave.